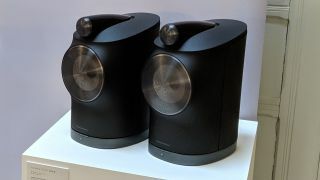 Wireless Speakers | Reviews and products | What Hi-Fi? The Wedge wireless speaker sees B&W back in the wireless speaker game in eye-catching style. Updated The Apple HomePod is the best-sounding smart speaker we’ve heard, and it now costs less than before. The Zipp 2 is a stylish and flexible wireless speaker, but there are better sounding options available. Despite outward appearances, this JBL is a wireless boombox of real class and clarity. The Acton II Voice has Marshall’s charming aesthetic, but sonically it's a merely average speaker. Bose's talented Bluetooth speaker delivers a huge sound for such a small design, so it could be worth a closer look. If you don't care about voice control, the impressively weighty Sonos is every bit as good as we remember.